Emilia is avoiding things - playgrounds, mothers with strollers, and telling her husband what she thinks really happened the night their newborn baby daughter died. But she can't avoid spending time with her five year old stepson Willliam. Emilia finds him insufferable, especially when he makes brilliant suggestions like she should sell the baby's things on Ebay. 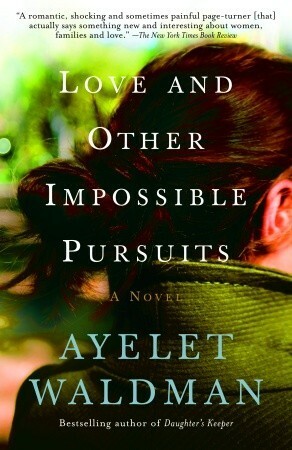 Love and Other Impossible Pursuits chronicles one woman's discovery of who to trust, who to love, and what truly makes a family. I have to preface the rest of this review by saying that I am slightly in awe of Ayelet Waldman. She is married to this fellow here, whose book I am currently reading. The two of them churn out brilliant novels all the time and in the meantime, they take care of their four children. I am jealous of their literary prowess in light of four kids. I can barely manage to write a few reviews with one kid running around the house! Moving right along...I found Emilia to be a really interesting character. She can truly be a pain in the tush, but she knows it. "That is quite nearly too much to bear, because don't they see that I am busy? Don't they realize that obsessive self-pity is an all-consuming activity that leaves no room for conversation? Don't they know that the entrance to the park lies right next toe the Eighty-first Street playground and that if I am not completely prepared, if I do not clear my mind, stop my ears to all sounds other than my own breathing, it is entirely possible - likely even - that instead of striding boldly past the playground with my eyes on the bare gray branches of the trees, I will collapse outside the playground gate, the shrill voices of children keening in my skull?" Emilia is dealing with her grief in a very loud, messy way. She can't go back to work and she can't face the world, so she is left in a sort of no woman's land. I felt that Waldman excelled in a tricky genre. Novels from the point of view of the child tend to paint the stepmother as, well, evil. Books that feature the stepmother as protagonist seem to contain awful children and their nasty mothers. Instead, this book gives us characters who feel like real people. We get a woman who is concerned about the effect that her ex's new wife is having on her son, a little boy who can't help but be outrageous due to his being five years old, and a woman who is truly baffled about how to be a good stepmother in the wake of her incredible loss. Ms. Waldman infuses this novel with a wry humor that offsets the difficult circumstances that the characters find themselves in. There is a sort of twisted irony in being the other woman after the marriage of your parents was dissolved in the same way. There is humor in a woman finding sanctuary in Central Park (which almost becomes a character of its own), but only if she can avoid the legions of stroller pushing super mothers who lurk around its entrances. There is also a kindness that is present throughout the story. Motherhood, stepmotherhood, and marriage are all very difficult pursuits and Waldman showers grace throughout for her characters and for those of us who are living these situations in our real lives. Love and Other Impossible Pursuits is a novel with brains that doesn't fall into predictable stereotypes or take cheap shots at your emotions. Instead, it presents life and love in all of its awful, wonderful, messy glory and asks its readers to think about what it means to love another person and create a family. This sounds like a lovely book. I read a negative review of it in another blog but I wasn't really convinced. I found your review really well thought out and balanced. Loved your blog! Following you now! Please do visit my book blog at http://riversihaveknown.com/ and if you like it, please follow! Thanks! I think that Emilia would be unbearable as a character if she wasn't aware of how she was acting. She knows she is not dealing with her grief well, and that makes it interesting instead of annoying. I've never heard of this author but think I would enjoy the book. Like you I'm in awe of her and her husband for writing so well with four children - I don't even have any children and I still struggle to find the time to write reviews! I read something once about how each person has (or gets from God) exactly what they need in their given circumstance. For example, if you have four kids you get exactly the energy to manage that. If you have a high-maintenance job, you have exactly the reserves needed for that situation. I think it's a good way to not feel badly about ourselves - we have what we need for this moment and if we get more things on our plate, we will find more energy (and maybe patience, too! ).